I just wonder if I might request your prayers. My son, Stevie, is hunting this week. Please pray that he will not get a bear. I do not want a bear rug, and mostly I don't want a bear carcass on my front lawn or even the back yard. Here is something to do with that little advertisement that comes in the mail, if it has a pretty photograph on it. 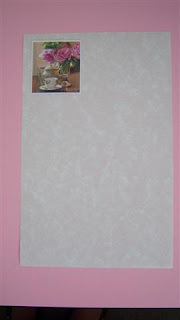 Clip out one of the pictures and use it to brighten up a plain piece of writing paper. Mounted on a matching strip of paper. Put the entire piece on paper and outline in glitter glue. 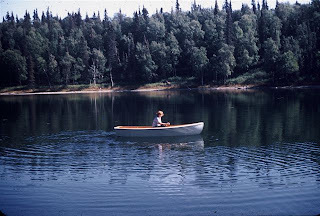 My mother, Lillian, in her canoe in 1953 on her little lake at the homestead. Because we have been more aware of unnecessary spending, my husband was able to treat me to a sentimental holiday for a few days, to a place where I once had an adventure. I am to walk the path to the hill between two lakes where my parents first homesteaded. It is over 50 years later, but it will be approximately the same day in September. This was the place where we learned to be so resourceful and innovative. 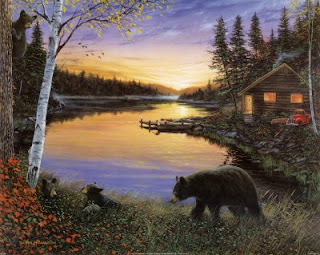 In spite of the fact that the Big House is not there, and the land has returned to the wilderness state, it will be good to just breathe the air. The man who now owns the land is deliberately keeping it in its natural state, in memory of our family. I will be happy to be in the land of the midnight sun, once again. I will imagine what it was like for them, seeing it for the first time, as a young couple in their early 20's, and I will be thinking of them living in a tent with three children under the age of 3, while the log home was being built. I hope to phone my parents from the little lake and see if they can hear anything from the nature. I am not good at sitting still for very long, as I like to be busy, so I hope I don't drive my friends crazy by trying to wash every dish in the sink. I may be posting a few times before I leave, and I may even get time to post from my homeland. who homesteaded there and who have a gallery of Norman's Alaskan art. He paints under the name of Norman Lowell. I knew him as an art teacher, and attended some of his classes when I was a girl. Another highlight will be meeting a childhood friend, Carol McGahan who was a neighboring homesteader (as neighbors in those days were anyone you could drive a car to visit) from a family very much like my own. I am also looking forward to my stay with a family that took so many pictures to help me put my book together about the homestead. 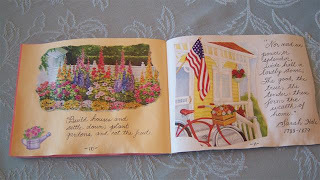 I have been scurrying around trying to get the home in shape, and get myself ready, too. I don't like to leave the house a shambles when I go anywhere. I've learned that it makes it too gloomy when it is time to come home. Everyone has seen this picture many times, taken around 1955. I hope the water looks blue like this when I next see it. This is what we did when we were little...our Dad took us for rowboat rides. It was better than Disneyland. It has been made into a U.S. postage stamp, available at Zazzle.I used it on letters several times, and it actually takes the letter where it is supposed to go. My friend from Victorian Lady blogspot has sent me these from a company called "Pro Flowers," which cuts their florals directly from the garden and mails them. They last a long time, and I just love this multi-colored bouquet. This kind lasts a lot longer than florist bouquets. They arrived in a box at my door. 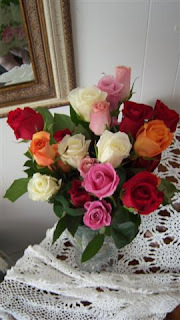 Sometimes they have a two for one special, and when she orders a bouquet, she can also have the other one sent to someone else. Thanks, Lisa!! There are some frugal ideas for the areas outside surrounding a house. 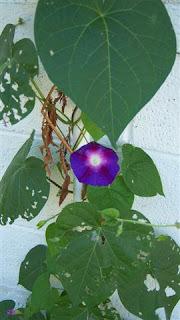 Here is a morning glory that is disguising an old pipe on one wall, that grew from a seed. 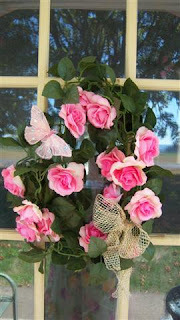 A wreath for the front door from a garland of silk roses, topped with butterfly on a clip, and a wired mesh ribbon from a dollar store. 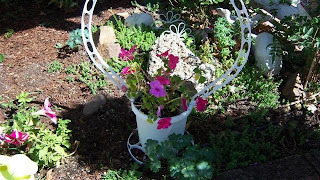 Sometimes the plastic containers from flowers at a wedding or memorial service can be used again outside by setting a pot of flowers inside. 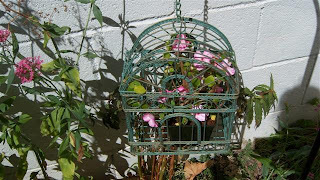 Recycle an old birdcage by putting a potted plant in it. 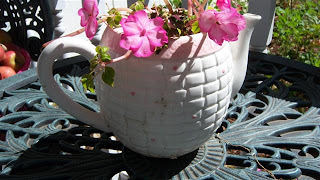 Use a chipped teapot with a missing lid to display flowers. It will need drainage so if the teapot is cracked, that is actually better. If not, put rocks in the bottom. 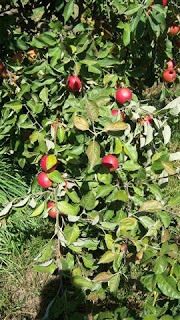 The apple harvest is on, from a Japanese apple tree. I just love the innovation of the Japanese, because this tree is just my height and so I don't have to get on a ladder. When our daughter was young, she asked for a fruit tree on a birthday. I thought that was a good idea, and could imagine how many fruit trees we would have. This one is paying us back even though she isn't here. 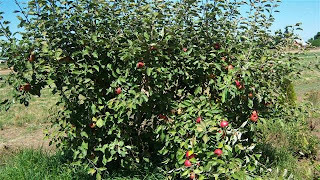 Toys and things just take up space, but a fruit tree gives back something many years later. I have a lot more "shapes" in my head, but as there are probably a million of them, I think maybe when I get time, I'll show the process of making your own template shapes. You can give a man a fish and he will eat for a day, but if you teach a man to fish, he'll eat for a lifetime. It will be interesting to see what kind of templates other people come up with for cards, clip art, or tags. When we were growing up in a frugal household, our parents only used money for things they could not make, themselves (like fuel, a motor for the boat, and a few essential household items), and they tried to find a way to make everything else, instead of spending money. That generation was a "saver" generation, and we can learn a lot from them. Although the savings come a little at a time, by not going to the grocery store for everything, it eventually means that you can use extra money for something. These could be a lot brighter and more elaborate, if someone had the time and imagination to experiment. 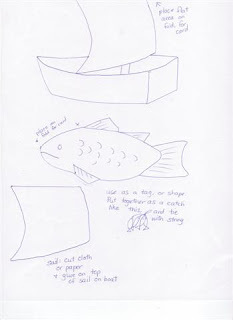 Place the sail on the folded edge, or edge of the paper, with the end of the boat on an edge, too. 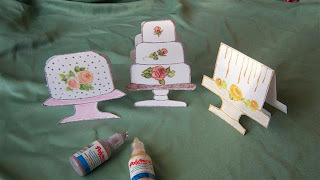 The boat and fish on the left are cut from a linen-look pastel card stock, and outlined with puff paints and glitter glues. If you find the glitter glues difficult to manage, try this hint: always turn your paper so that your strokes and lines will go from left right if you are right handed. 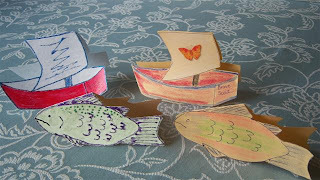 The boat and fish on the right are cut from construction paper and colored with metallic crayons, which is a good project for children. Here are the templates. Hopefully the lines will show up much better when printed out. 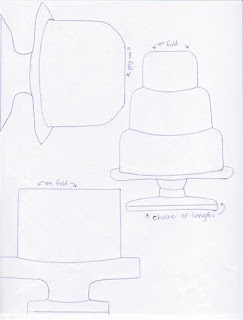 Here is a sample of a cake card, but the shape could be used for other things. These are made with Polymark paints, stickers, and crayons. These are for the children, made with contruction paper and crayons. A paper doily is added to the square cake on the right. Here are the templates. If you are going to put them on card stock and cut around them, be sure to cut off your own lines, because it will make the card too big for the envelope. Cut a sliver of paper off the bottom and tops of the cakes and it should fit alright. Place your templates with the flat top of the cake on the fold. I am sure there are a lot of creative ideas out there that everyone has, which could make these look more like cakes. 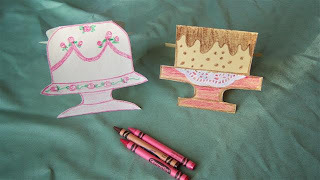 Try tearing small pieces of construction paper, like petals, and glue them all over the round cake, for an icing effect. Add any kind of embellishments or glitter. There are probably many people who feel, after writing a letter to their mother, or a friend, that they have written a novel. 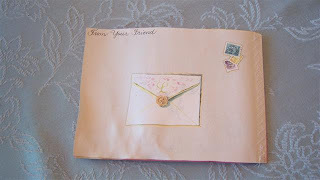 This is a sample of a "letter book" that is made of simple construction paper from the dollar store, which fits inside of an envelope, and can be mailed. The pages are stitched on the sewing machine. 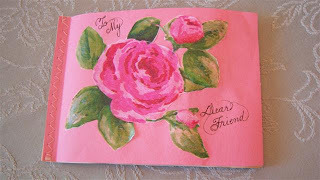 The rose is cut out of tissue wrapping paper, and glazed with a glitter glue, using a brush. The clip art is just made from things around the house. It fits inside a large card envelope. 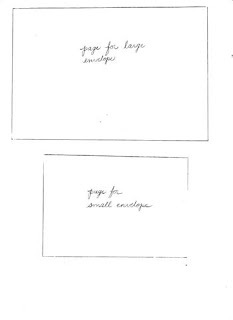 If you do one of these, remember to cut your pages about adequately smaller than the envelope, or it will not fit. I was enjoying a new magazine that came in the mail today and I thought, "Wouldn't it be nice if I could get a magazine that had only the things I liked, in it?" This is a way of sending someone a personal magazine, without the ads, and with only the things that are pretty and suit her. Pages 1 and 2 are like the letter from the editor in some magazines. 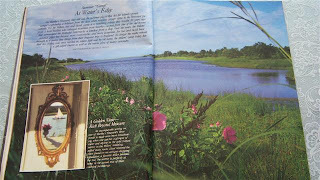 The white rose with the sparkle on it came off a gift bag, and the clipping of flowers from a used calendar page. Page 2 was kept blank until the entire booklet was completed, so that it could be used as a table of contents. 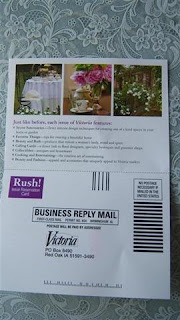 The clipping on page 3 is from the Victoria magazine subscription card that always comes in the mail or in the magazine. 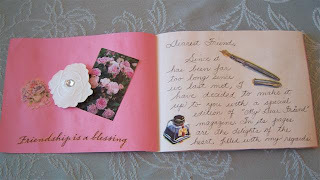 The picture is too pretty to throw away and also makes a great card when pasted on cardstock. Page four has a little pocket for a tea bag. Bigelow English Breakfast is now making pink tea wrappers in a pink box, available in local grocery stores. 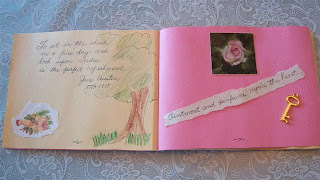 Page 6 and 7 has hand drawings and more construction paper is torn to look like parchment, for a handwritten verse, which is sprayed with a scent. Here is page 8 and 9. 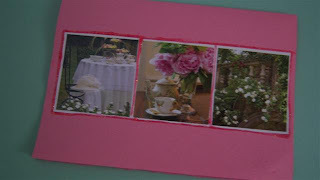 A small round doily is pasted down, and roses are cut from a seed catalog. 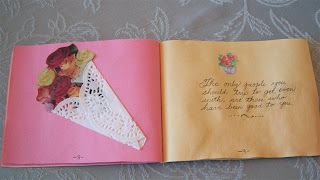 Then, the doily is folded on each side, making it look like a lace holder. Just as I was finishing page 9, I spilled some water on the page, but after it dried, it looked okay. I guess I won't be drinking water while I work with paper. Page 10 is a clipping I tore out of the same garden catolog. Here is the back. Below is a template for pages, if you want to try it, but please keep in mind that my drawings are not accurate. These are about an eighth of an inch smaller all around, than the envelopes. Dollar Tree has construction paper that contains very nice pastel colors. Construction paper is light weight, but be sure to have your letter weighed at the post office, before putting a stamp on it. 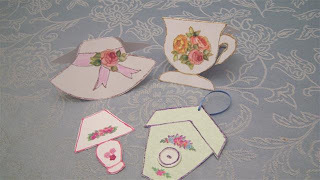 The hat and cup are folded cards, with floral stickers and glitter glue. Crayons are used for solid colors. The little lamp is a book marker. Just place the template on the fold, as it is supposed to be double. Inside, a verse can be written. The birdhouse is an ornament made with stickers and a button. A hole punch is used and a ribbon is tied through it to make a loope for hanging. To make it easier to send in the mail, make your own button, using colored papers or cardstock, and a hole-punch to make the holes. All of these cut-outs fit card size envelopses. Print this pattern on cardstock for your templates to trace around. Put straight edges at the fold, and cut. 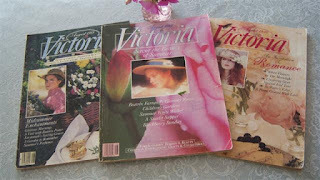 Victoria magazines from 1988, '89, and '90. The pages are from the '88 and '89 issues. This one looked like a Frederick Morgan painting from the 19th century. 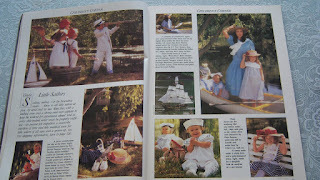 I really liked the blue sailor dress on the girl at the upper left. I used this picture a lot when I wanted to paint little things on the edges of letters I was writing. These were garments by Nancy Johnson, and I thought the hat was interesting. Outdoor fun with the old folks at home. 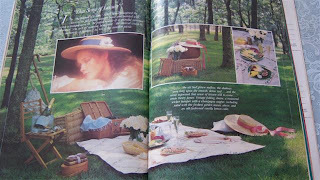 This was like the Ideals magazine, giving pictures to interpret and emulate. 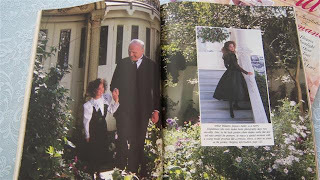 Loved the Papa with his little granddaughter, and I always enjoyed looking at this girl going up the stairs. I think young women would really like to look like this today, and look happy in their clothes. This was a favorite page of my children when they were younger. They used to stare at it a lot; a picnic on the ground. 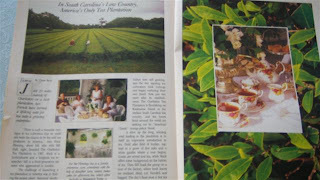 The one article about the only tea plantation in the U.S. I think it was a generational, family enterprise. 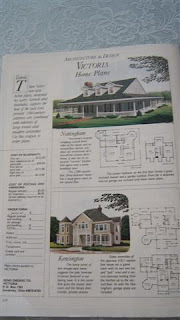 And, of course there was usually a page of house plans with the floor plans sketched out, in the back of each magazine. The children always liked to look at each little room and imagine where it was in the house. There were some ads in these first issues that weren't attractive. I think ads should go with the mood of the magazine and if its a Victorian magazine, the ads ought to be pretty and in keeping with the theme. Since I have learned from other crafters online about altering books, I've started to take little scraps of papers, metallic lace doilies, stickers and things, and alter the unattractive ads. Now that my children are grown, and gone from home (well....there is a slight technicality there--they DO come back, and they bring more with them! ), here is what I am going to do. 1. All these years my husband and I have looked after our children. I'd like to focus more attention on my husband and do some things with him. 2. I hope to get a chance to really catch up to all those things that I was constantly putting off, when my children were being raised. 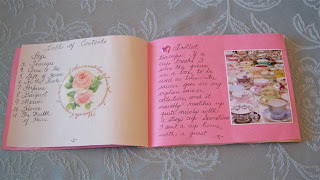 I have scrapbooks and photograph albums to catalog and date. I have old clothes to sort through. I have bedrooms to convert into office or sewing rooms or guest rooms. I have to go through my children's belongings and make a trunk of their childhood things, for each one of them. I have also fallen behind in house work and house repair. I am going to repaint the house and re-decorate. Maybe I'll get rid of the old worn out couch and get a new one. I would like to give the house a fresh new look. 3. There has not always been a lot of time for the ladies of the church. I would dearly love to have more time to host them in my home for Bible study and to take in younger women who want to learn to sew or keep house. I'd like to be able to serve others more, that are outside my own family. 4. I need to recover my health. I'm going to start getting more rest and devote more time to the garden so I can get more exercise. 5. I am going to plan a trip to visit my own mother and father. When I was a busy mother myself, I did not have as much time for them. 6. I'm going to be available for any of my children who may need my help, or who may come home for awhile. 7. All the way back in history, my ancestor mothers and grandmothers, aunts, etc. were homemakers full time. I would like to experience what that life was like, by doing it myself. I would also like to see what following the Titus 2 model will be like. I'd like to experience it! I'd really like to try it! I want to see how it works and how effective it is. 8. Since I have sewn for others over the years, I've fallen behind in sewing for myself. I am first going to catch up on that, and create myself a nice wardrobe that I can confidently wear, that even young people will like enough to want to know how to sew and how to dress modestly. 9. Since I homeschooled my children, I'm going to be available for encouragement for my grandchildren. 10. I'm looking forward to getting into my fabric stash (which came out of the closet) making little dresses for my adorable "Miss Pooh Bear" at The Pleasant Times. You asked if I considered going to work outside the home. It is interesting that you should ask that. I've got too much to do at home, and my husband's salary is enough for both of us, especially since we've been eliminating a lot of expenses and lowering our debt. With the children gone, I am learning more and more about ways that two can live as cheaply as one, and how to manage on our income. Also, as I am getting older now, I want to be able to lie down and rest when I feel the need to do so. I need to be home to prepare meals for my husband and keep his clothes laundered and ironed and help him get ready for work in the morning. I'm still very much needed at home, and I have a lot of experience in homemaking that I would like to use now, and also pass on to others. If I leave my home too often, it will suffer neglect. As I want to be a good example to other women, I can't really go out to work and neglect my home. I would be just to tired to keep house after work. Most women my age are retired, anyway and would not be out in the working world. I am not retired, as there is still a job for me at home. As gas is so high these days, I think I'll not buy it and use the money maybe for hospitality or to help someone in need. I don't really need to add to the morning traffic, and I think it will leave the jobs for those who do not have a breadwinner in the family. I enjoy what I am doing, now, and am personally fulfilled by it. I do thank you for your concern, and I hope I've answered your question. Please, let me know when I can set aside some time to have you over for tea. I am trying out some new recipes that I've always wanted to use. Here is my number. Be sure to call me. I'm usually home. If you are new at home living, you might find it interesting to observe the effect that your clothing has on your mood. One of the differences between staying home and going off to work with the rest of the pack every day, is the amount of time you will spend alone. You have to adjust to thinking for yourself, by yourself, about every little thing. This is something that most young women, used to going out to school every day, or to work every day, may find rather unusual. Dressing up a little better really improves the mood of the day, especially when you are alone. Those quiet days at home make you look forward so much more to the time when your husband comes home to share the evening with you. I have heard many stories of the past, where people, left alone in places that they felt isolated, still dressed up and had regular meals and behaved like dignified human beings. I think this is so important on those "alone days." Clothing can do a lot to energize or stimulate bright thinking. Dressing up improves those quiet days when you don't think anyone notices you. One reason that dressing well for an ordinary day at home is so important, is that it improves the mood. Colors and styles and patterns definitely have an effect on us when we are wearing them. To experiment with this, try wearing the grungiest clothes you can find one day, and the best you can wear that are suitable for housework and homemaking, the next. Wearing something pretty definitely improves the mood. I love cotton fabric and have made one dress for each day, which I call my "line" of clothing. They aren't fancy, but they will do for every day, and if I have to go out, I won't be embarrassed or self-conscious about whether or not I've gained a little weight (jeans and tight clothes tend to show every unwanted pound), or that I am offending anyone by having clothing too revealing, too short or too tight. n my town, there are religious women who wear only one style of dress, and I often wonder what they think when they see people dressed in practically nothing, to go to the grocery store. Partly out of respect for these ladies, and for my own dignity, I wear these casual dresses to the grocery store, the post office, the bank, and all the places where I do errands. Everyone would agree that choosing a wedding dress is important. What if the bride to be, whilst looking for a gown, was told by a friend, that it doesn't matter what she wears to the wedding, as long as she gets married. The vows are the most important, they would say. Who cares what you wear? What if her friends were to intimidate her by saying that her desire to wear a dress to her wedding, instead of wearing shorts or pants, was "legalistic." It is understandable that she would want a special dress for that special day. If she showed up in something else, her mood would certainly be affected, and so for that matter, the moods of others. Yes, weddings are special enough to warrant a special garment, but each day after that is special, for it is a gift from God. Having special clothing to wear to celebrate the ordinary day makes your outlook on life so much more optimistic and seems to enhance your appreciation for every little thing, from the sound of a warbling bird in the morning, to the view of the sunset in the evening. I wonder sometimes if we rob our young women of the pleasure of wearing dresses daily in the home, because they are afraid of what others might think. Others may make them feel self-conscious and leave them with a feeling that they have to constantly explain why they are "all dressed up." As I have grown older, I've found that dresses are more comfortable if they are made right, and if they are 100% cotton, but they also improve my mood and effect the way I keep house. I have pictures of my great grandmothers in their typical Victorian clothing, and I notice in a lot of old books that I have collected, that women around the world wore similar clothing. I don't think at that time, during that era, they were dressing that way because they were "legalist." 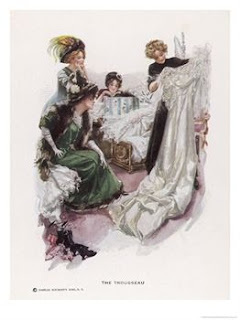 Linda Lichter did a good job of explaining the reason for their style of clothing, the reason they didn't bare so much skin in public, in her chapter about clothing, in "Simple Social Graces" (also under the title, "The Benevolence of Manners.") This historical account helped me to understand better the importance women placed on covering themselves and the courtesy they showed to others in that act. This is a sample of some cotton dresses that I sewed for daily wear. I call this "My line of clothing." They aren't perfect, but they suit my every day life. When it is a bit overcast in the sky, I like to wear something blue or yellow, and there are some days that just seem like white and other days feel more like a celebration, so I may wear a brighter color. I don't know if other women are "mood dressers," but I certainly am. I like to choose clothing to contrast or to match the feeling of the day, whether it is cold or warm, sunny or dark. "Choose clothing that someone else would want to wear when you are finished with them." Adam Clarke (1762 - 1832) That women adorn themselves - Και τας γυναικας ες καταστολῃ κοσμιῳ. The apostle seems to refer here to different parts of the Grecian and Roman dress. The στολη, stola, seems to have been originally very simple. It was a long piece of cloth, doubled in the middle, and sewed up on both sides, leaving room only for the arms; at the top, a piece was cut out, or a slit made, through which the head passed. It hung down to the feet, both before and behind, and was girded with the zona round the body, just under the breasts. It was sometimes made with, sometimes without, sleeves; and, that it might sit the better, it was gathered on each shoulder with a band or buckle. Some of the Greek women wore them open on each side, from the bottom up above the knee, so as to discover a part of the thigh. These were termed φαινομηριδες, showers (discoverers) of the thigh; but it was, in general, only young girls or immodest women who wore them thus. Guarding the Home From Within. "The true secret of happines lies in taking a genuine interest in all the details of daily life." "Have nothng in your house that you do not know to be useful or believe to be beautiful." This post is directed to the young woman at home during her first year, but as all things, can be applied in any stage of life. When I remember my childhood dreams, most of them were about having a house. At the time, it mattered not if it would be a little shack or even a tent. It was fun, to me, like playing house, to arrange it and make it my own. Playing house is important aspect of growing up, because it shows the thrill and delight of having a home. I remember this playing, and how we guarded these little pretend-dwellings against clutter that would make it undistinguishable from a barn. We wanted it to look like a home and feel like a home. We didn't like to have things in it that were not related to home living. As years went by, we had to guard our homes against so much more, from within the house itself. There was the radio, the television, newspapers, magazines, the mail, and the telephone. In "the old days" these things were welcome friends from the outside world. The magazines depicted women as sweet, innocent lovers of the home, as evidenced by these vitage "Modern Pricilla" women's magazines. You will have to scroll down quite aways on her site to see the covers of these magazines. I was so drawn into the feeling of love and home-nostalgia that looking at these covers, once again, gave me. Today, the magazines are often heavily laced with things of a less contended nature. So, we had to start guarding our homes against discontent. To explain this, let me give you an example of a morning television program. The homemaker is doing a few things around the house and she is half-watching, half-listening to a broadcast about designer bags. They are shown in such a great light, and the model who is displaying them looks so sleek and sophisticated, that in comparison, the homemaker, just trying to pick things up and make her house nice for her husband, starts to feel a little put-out, peeved, disgruntled; and even resentful. The bag looks so desireable, because it has a designer name right on the outside. Guarding our homes from within, meant that we had to continually re-focus on what our mission was, not on what the world was luring us to. The television could be a source of comparison that was not healthy for the home. The home had to be guarded against envy and against discontent. Besides discontent, we had to guard our homes against time-wasters. Even though we didn't have the amount of media that is available to us today, there was always the danger of getting on the phone too often and too long, and in those days, it didn't have a very long chord. This was one thing inside our homes that could be a useful tool or a problem to guard against. Today we have cell phones, but they are not healthy to use. It is better, if you feel you must use one, to use the speaker phone feature on it, rather than hold it up to your ear. Media seems to be one of the biggest consumers of time that confronts the young homemaker. We also had to guard our homes against the world's values and language. People coming home from work or school, tended to forget that the home was a sacred place, and it was not obligated to blend in with the rest of the world in order to make people feel "more comfortable." Women at home had to insist that foul language, the new slang and expressions, and scandalous talk, not be engaged in during dinner time or other times amongst the family. This kept the home a quiet, peaceful place. There was also the constant change in decorating styles. As children in our play houses, we were content with a little broom, a mop, some calico curtains at the window, a box to sit on, and a bowl to wash dishes in. 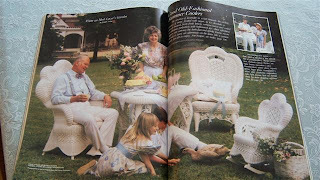 As grown-ups, we had to concern ourselves with many choices, and after the choices had been made, the glossy flyers would come in the mail advertising a new style of furniture that we would have liked better. There seemed to always be someone coming around the corner with another lure. Media had a great effect on the home, and it was the woman's job to guard the home from any type of publication, book, or literature that did not strengthen the marriage and the family. So, we had to guard our home, to a reasonable extent, against change. Change is not all bad. It is good to change your clothes for clean ones, change your furniture around, change your bad spending habits, change your erroneous thinking about certain philosophies, change the things that come into your house, and change the way you spend your time. The "change" that we have to watch out for, today, is the change that would cause instability, create more debt, or estrange your children and your husband. To guard the home from within, a woman has to also guard her heart, for it can still be swept away by things that appear to be more fun, and easier. The grass, on the other side, still has to be mowed, and there is always a downside to things that seem to be more exciting, so she has to guard her heart continually. Sometimes the outside world can make life at home seem dull. One tactic to guard the home from this impression is to pay attention to the details of your life (note the quote by William Morris) and develop a new appreciation for everything. Putting your heart back into the home that God has provided you, can take away envy, discontent, time wasters and confusion. When we were little, a lot of us in that era used to enjoy our things. We would wash our clothes by hand, hang them out to dry, iron them, and then hang them up according to color, in our tiny closets. We folded our clothes neatly into our dresser drawers. When we played house, our dishes were washed and dried and put away. We set the table in the highest fashion we could. We were happy to have a little home and our playing reflected it. I think we can take that same mood into our own, grown-up homes and make them a place of delight. 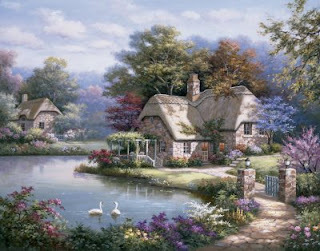 The woman at home for the first time, will have to guard it from within, so that things take over her mind and her time, but in return she will have a bright, peaceful spot for her husband, that will make him sigh with relief when he arrives home from the stresses of the world. Whether a woman is just married or has just come home after being married for some time, here are a few things that have always, throughout the ages, been a concern for women at home. I will list them under the titles of time, duty and destiny. I am sure there are many more that people could add to this. Time: I don't know if other married women found this problem during their first year of marriage, but the good use of time is so important. Developing a routine of the home just about has to be done that first year, because it develops good habits of using time wisely. If you know that there are certain things you always do first thing in the morning, you can always use them as an anchor to get you started on the right path when there is confusion. For example, get your appearance ready--a bath, and a freshly pressed dress. It will be necessary to get up early and do this before the rush is on. If you don't, you will find your feet hit the floor running, and you are playing catch-up all day, maybe even never changing out of your night clothes. It never fails, that when you decide to delay getting your appearance prepared, that someone comes to the door that day. Fix your hair and your face and put on a dash of light perfume, and you will feel like you are going somewhere very important. If someone asks you why you are all dressed up, just say that your work is so important and the people you care for are so precious to you, that you want to dress up for them. I actually don't consider this "dressing up" in the formal sense, but these days, if you even put on a skirt and a fresh blouse, someone is going to look at you funny. (Here is an article on the subject of how to answer when someone says things like this http://www.meridianmagazine.com/imageintegrity/080805say.html . Time can really get away from you when you have interruptions. There are two kinds of interruptions in the homemaker's day: those that are necessary and those that are not. Guard your friendships so that they do not rob you of your time. As a newly wed, your loyalty is first to your husband, now, and not to your girlfriends. Time spent on the phone, or running around with "the girls" is time wasted if you are to establish your home that year. 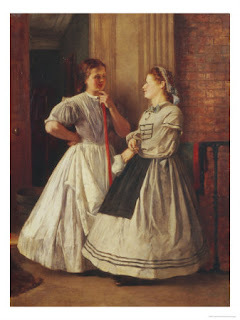 Many a woman has expressed regret that she allowed friends to crowd her time--time that could have been better spent completing important things at home: a sewing project, preparing food, cleaning and improving the appearance of the house and yard, etc. While it is nice to have girlfriends, sometimes they do not understand that your loyalty is now to your husband, and that you have obligations at home. If you can't work and talk on the phone at the same time, it is better that you do not use it, for it can waste a lot of your time, especially if you are not an experienced homemaker. Be careful of friendships altogether, that they build up your marriage and help you, rather than rob you of your time and emotional energy. Your mother and grandmother, and other wise, older women are probably better guides for you, if they have had good homes, than your younger friends. Set aside some time for others but do not let them run your life. Choose older women of wisdom, who have had successful marriages and orderly homes, and good children, for your friendships, until you become more proficient at homemaking. We live in an era where we think "peers" are important, but peers do not have to be all your own age. Sometimes the girls your own age will not understand the necessity of you being wise about time. They may reason that since you are not "out working" that you have all day to laze around, so they may visit and take up your time. Then, when your husband comes home, he is starving and dinner is not ready. He is tired ,and the things that you could have done while he was gone (and unable to do them) did not get done. He then has to help you catch up and still go to work the next day. He may have to help you make a hurry-up dinner. To prevent this, you have to be very busy and serious about your life at home. Remember that you are a help-meet for your husband and so , while he is away, do the things that are helpful to him. What is the point of having a helper if the helper is busy meeting other people's needs all day? Duty and destiny are combined, for whatever your duty is, will determine your future. Some women complain that things "just happen" to them, but being diligent at home can reduce a lot of the mishaps in their lives. Picking up and cleaning up and having a routine are part of your duty. There is an old saying that used to be put in little plaques on the wall: "Duty Before Desire." We understood this to mean that after we got the dishes washed and put away, after the floor was cleaned, and the bathroom wiped and the beds made, the meals prepared, and so forth, we would have earned our "down-time." That time was for sitting and creating things, writing letters, reading good books, preparing celebrations, shopping, and so forth. Young women can look ahead and think: What do I want my married life to be like 20 or 30 years from now? Well, it will be somewhat the way it is right now, so analyze carefully how you are using time, and the fulfillment of your duties, and you will be able to foresee your destiny. Instead of just letting "things happen," learn to control your day by creating a routine. This is not the same as a point by point schedule. It just means that in the morning, certain things will be done, as in the afternoon and the evening. Our forebearers had some things figured out long before this. 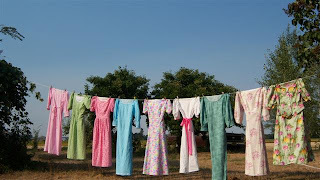 Women had dishtowels with the weekly jobs written on them: Monday is wash day, Tuesday is ironing, Wednesday is shopping, Thursday is baking, Friday is mending, Saturday is rest, Sunday is church. It varied, but basically, it kept them from having to do the same things every day. I have tried this and found it to be more efficient and restful than doing all of it every day. There will be every-day jobs such as cooking and washing dishes and straightening up the normal clutter of a home, but having a day to write letters and a day to hang out laundry, can help make a routine for you. Jesus told his disciples to go beyond "duty" when he said, " And whosoever shall compel thee to go a mile, go with him twain." (Matthew 5:41). We can be inspired by this, because, to tell you the truth, just doing what you "have" to do can be very uncreative and boring. It is when we go beyond the mere doing of something, that it becomes interesting and fun. It is when we try to do it extra well, and make it a beautiful masterpiece, that duty becomes desire. This explains why many people of old actually enjoyed working in their homes, improving their property and yards, and baking a pie, more than they enjoyed being entertained. When you are first married is the time to develop that habit of making even ordinary jobs shine. If you will use that first year to practice this good attitude, it will serve you well when the children come along (and even if they don't) and in making your home something to be proud of. Slothful living costs you more, and making good use of time is like saving money. My great grandmothers were all full time homemakers and so was my mother and my husband's mother (and his grandmothers). No one in their day would have had the audacity to suggest that they get out and earn a living or make money: it just was not done. I have stated here, before, that no man who was really a man, would have sent his wife to work, and if his wife offerred to go to work, even in hard times, most men would have hung their head in shame. They would not have been able to look anyone in the eye. Even people who did not know the about the New Testament teachings on the subject, knew that it went against nature and all common sense, toforce the woman to take on the burden of "bringing home the bacon" or being the breadwinner. A man knew he was to work "by the sweat of his brow" to provide for his family. It was considered a national shame when a man neglected his duty to be the provider and the protector of his family. Being the family provider and a protector of women and children, made him more of a man. Not doing it made him weak and wimpy. Now of course, I am speaking here of able-bodied men, not those who have broken backs or no legs or those who have severe handicaps. In general, if a man's back was not broken and he had two legs, there was no excuse for him not working. In hard times where jobs were not available, real men found ways to keep busy and they were quite innovative about creating an income. At the same time, women had a huge respect for the family coffers. 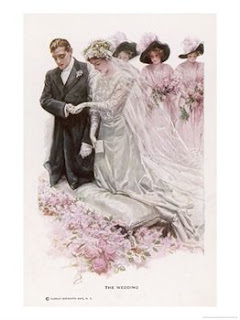 Those who really valued their marriages and their homes, did not want to waste away their husband's hard-earned money, and guarded it more carefully than many women do, today. Those who lived in those times can attest to the fact that the reason our parents and grandparents ended up with a new car or a new and improved house, was not because the wife went to work, but because the wife guarded the home and the family bank account, to make this possible. There were a few, as there always have been throughout history, who tore down their own security by unneccessary expenses, but in general, there was a mood to save, to make do, to make it yourself, or do without. If women were not married, they often worked for awhile at simple jobs, but it was more for the opportunity to meet a man to marry, than for the glory of the job itself. Getting married and being with one man was a step up from working for an employer. This was the world I was born into and the world I grew up in. You would think that after 40 years of homemaking, and after knowing of my mother and grandmother before me, the reason for my staying home full time, would be well understood. However, this is the new age of ignorance, it seems, and after all this time, I am finally getting the remarks like, "You need to get out and DO something," or "How can you afford (whatever it is) when you don't earn any money?" and "What if something happens to your husband?" Truly, these remarks are aimed at just about any woman who takes up the lifetime task of guarding and guiding her family and the home. I gave up trying to give long explanations about it because I discovered that they are not as interested in how I manage it without taking on employment outside the home, as they are interested in pushing me out there to join the workforce with everyone else. They hope to scare me into submission to this concept. Somehow, the shame of sending the wife to work, has been removed from the hearts of many men. It is the reason we are in this trouble. 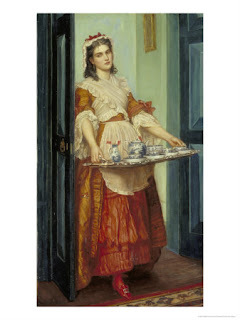 There seems to be a revival of interest in the Crinoline Lady. I found a Crinoline Lady teacup here, which is rare, and it brought back some memories of the Crinoline doll kits we used to be able to get. I remembered a punch out paper doll that fastened in the back, but couldn't find a pattern for it so I spent a few evenings cutting and pasting, til I arrived at this, and I would like to share it. A little girl comes over to my house once a week and we play. She had never been shown how to make paper dolls and was quite enchanted with this concept and I could see it was really absorbing her, so I decided to publish this for everyone else. Here they are sitting on the table cloth. You could perhaps write a name on each one. These are made with typing paper and colored with my deluxe crayon set, but sketch paper might work better, as it would be sturdier without being too stiff. Crayons work better on art paper, as well. 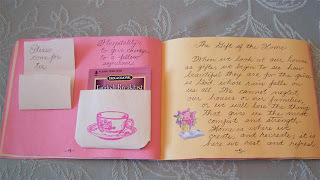 Chalks would work very well as colors, if you have the artists chalks that people use with rubber stamps. If you use it for a napkin ring, you will have to tape it in the back and bend the doll bodice forward more. 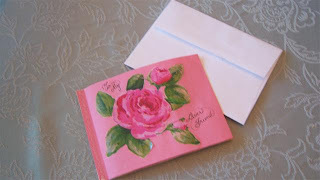 I designed these so that they could be sent in a regular sized card envelope, as you see here. However, if you use the pattern as a template, it will turn out a bit larger, due to your lines being drawn around my lines, so you'll have to trim off your outer lines before inserting it into the envelop. Put it in the envelope flat and write instructions for assembly. Be sure to clip the tabs before sending it to someone. They are cone-shaped and stackable. This is the cardstock lady with a stand in back. To make it sturdier, make the stand double cardstock. You could use these as placecards or insert them in envelopes for invitations. 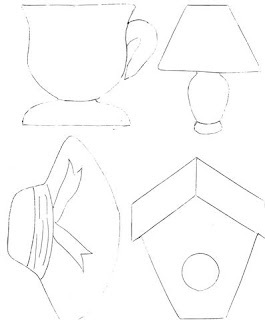 Here is the template for these paper dolls. 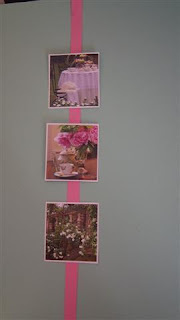 You can copy it off as many times as you like, and you can also paste it on cardstock and use it as a template. Right click and save it to your pictures and then print it out. Its free now, but later if it goes in a book, you'll have to pay for it, so have some fun with it if you want to. The doll with a stand, works best on colored cardstock. You can embellish it with stickers or special glitter pens and glitter glue. The circular crinoline doll does not work well with cardstock but you could try it. I found paper easier to work with. Be sure to cut the mark in the back to hook it together. One cut is on the left of the tab and one is on the right. Clip them and insert them together. If you use colored paper, I've provided the dolls bodice to glue over it. Copy it several times to make pictures to color. 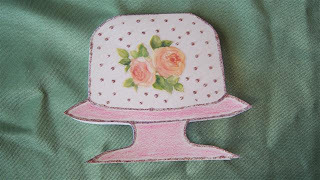 Polka Dot Rose has some vintage cards which show the little girls dresses that inspired my Crinoline Lady Paper Doll. I hope this shop owner will keep the pictures there even if she sells the cards, because they are so pretty and show a bygone era that was so sweet and innocent for girls. Lillibeth gave us this tea cup. It was such a surprise. She knows I've always admired the English cottages, and she spotted this Royal Albert in an antique store. I was only mad because she spent way too much money on it. I am still in the past, trying to get things for 99 cents. This is a different shot of the tea cup to show how the floral motif on the inside matches the saucer. My criteria for tea cups is: the more there is on the cup, the more I get for my money. Something on the inside of the cup makes it more entertaining as one takes tea.